This is based on one of the many traditional Italian pasta dishes that are a part of our Christmas Eve feast called “Pasta and Nuts”. The original recipe is made with an anchovy base and the pasta used is spaghetti. I thought it would be fun to put a slightly different spin on this family classic. And don’t forget to check out the tips after the pictures! Preheat indoor grill pan (or outdoor grill). Drizzle eggplant slices with olive oil and place on grill. Cook about 3-4 minutes per side until lightly browned and fork tender. Salt/pepper immediately after taken off grill and place aside. Bring a pot of water to a boil and add pasta- cook 8-10 min (do not overcook- you want pasta to be al dente). 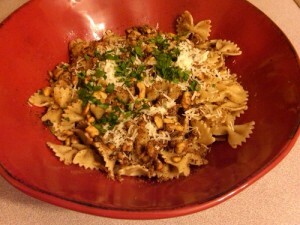 While pasta is cooking, in a large dry skillet over medium low heat, toast the walnuts for about 5 minutes. 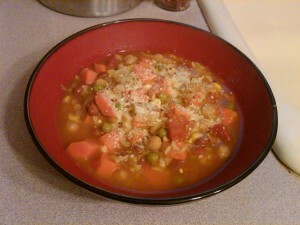 Once they are lightly browned, add the cup of bread crumbs and toast for another 3-4 minutes. Drop heat down to low and add the garlic. When pasta is done, drain and add to skillet. Drizzle with olive oil, add grated cheese and toss. Sprinkle with some chopped flat leaf parsley and crushed red pepper flakes. 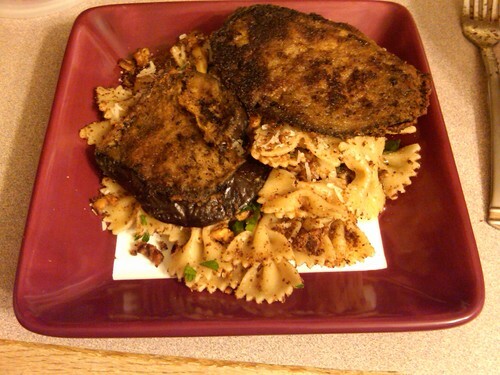 Serve topped with the grilled eggplant slices. *Toasting nuts brings out their natural oils therefore you don’t need to cook them in any oil. However, this can cause the them to burn so cook them over low-medium low heat and never leave them unattended. *Al dente pasta (firm but not too hard) has a lower glycemic index than pasta cooked soft.